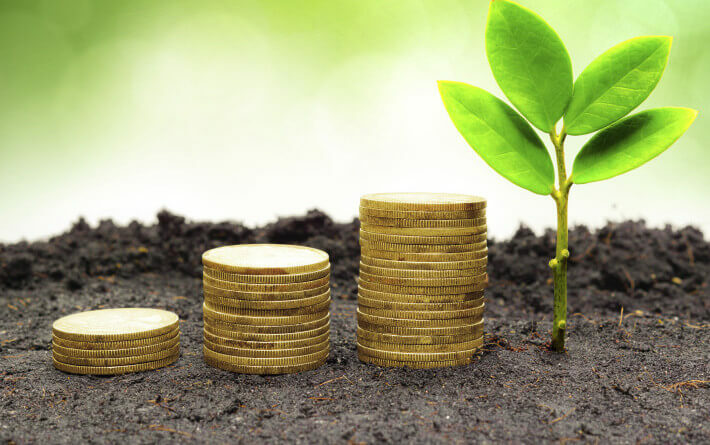 A recent survey published by Merrill Lynch’s Private Banking and Investment Group uncovered alarming statistics with regard to the universal goal of sustainability. “The Meaning of Sustaining Wealth” was a survey that included 171 participants, meant to gain insight into the desire to sustain wealth and the plans through which individuals intended to do so. The wealthiest participants of the study had assets valued over $10 million, 63% of whom viewed sustainability from a multigenerational perspective. By that we mean that those individuals intended for their wealth to last for several generations. Participants who were age 55 or younger didn’t appear to have asset sustainability timelines that were quite as long; 58% of them aimed to support themselves and their children through their lifetime. It’s important to consider just how someone defines sustainability as it pertains to their wealth and assets. The study found that many participants thought about sustainability in terms of particular goals, such as helping their kids with down payments on their first homes, or putting their grandchildren through college. In order to plan your personal finances and maintain your family’s wealth, defining sustainability is an absolute must. There’s a pretty significant difference between allowing your children to stay home for a few years after college and supporting them as they kick start their careers and putting away enough to put 10 hypothetical grandkids through medical school. The way that you define asset sustainability will also determine how much money you can safely spend every year without whittling it all away. According to the study, despite the fact that most people were in agreement that they definitely wanted to sustain their families’ wealth, very few had realistic expectations for how to make that happen. What is a Realistic Distribution Rate? If you wanted your investment portfolio to last indefinitely, what’s the maximum rate at which you could take distributions? Forty percent of survey participants were under the impression that a distribution rate of 6% or higher could sustain their portfolios. Another 20% didn’t even give an answer, because they had no idea and couldn’t even give an estimated response. The reality is that the distribution rate of an investment portfolio often needs to be kept between just 2 to 3% in order to be sustained indefinitely. An alarming 16% of participants gave that answer. 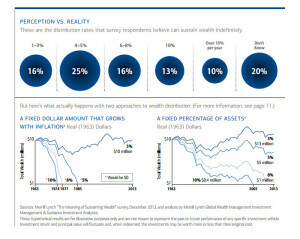 Two graphs from the survey illustrate what would happen with both a fixed dollar amount that grows with inflation and a fixed percentage of assets from 1963 to 2013 with distribution rates of 3, 5, 8, and 10%. In the case of a fixed dollar amount that grows with inflation, with a distribution rate of 10%, $10 million would dwindle to nothing in just 11 years. At an 8% distribution rate, you’d bottom out by 1977, and at a 5% distribution rate you’d go broke by 1985. However, if you kept your distribution rate at 3%, in 2013 you’d still have $10 million, because what you’re taking from the money that’s accruing would even out with the rate of inflation. In the case of a fixed percentage of assets, your money wouldn’t be reduced as drastically over the same time, but it would be a tremendous reduction nonetheless. If you start with $10 million in 1963, with a distribution rate of 10% you’d be left with $0.4 million in 2003. By 2013, you’d have $1 million left at a distribution rate of 8% and $5 million remaining at a distribution rate of 5%. However, by the same year at a distribution rate of 3% you’d have gained $3 million for a total of $13 million! As always, if you have financial planning or tax-related questions, the tax professionals at DeFreitas and Minsky LLP are here to help! Give us a call at (516) 746-6322 today!